that left the birnand in ane felloun fyre." My earliest known ancestor Angus Kennedy lived on the north shore of Loch Rannoch and was born there in the early 1750s. Unfortunately the parish register for the parish of Fortingall, which included Rannoch, only dates back to 1748. To add to the difficulties, there were two Angus Kennedys born there at about the same time - one in 1751 at Kinloch Rannoch and the other in 1754 at Aulich, 4 miles further along the loch side. Angus married Elizabeth McKay at Ardlaroch (sometimes spelt Ardlarich), a small settlement at the west end of the north shore. They started their family in Rannoch but like so many others of the time then moved south to just across the border in Stirlingshire, on land owned by the Grahams of Gartmore House. Did they leave of their own free will or where they thrown out of their houses? A short history of Rannoch which has been published on line actually mentions both Aulich and Ardlarich as places people were evicted from. The lands were owned by Robertson of Strowan and were forfeited to the Crown in 1690. There is substantial reference to them in 'Forfeited Estate Papers 1715, 1745' published in 1909 by the Scottish History Society. There is a report by the Factor concerning the condition of the Estate of Strowan, compiled in December 1755. Further coverage of how the Highland Clearances effected Rannoch can be found in 'History of the Highland Clearances' which I review here. If Angus had been born just a few years earlier, he would have witnessed the Cameron chiefs come knocking on the doors on both sides of the loch, summoning some 100 men, mostly Camerons, to fight in the 1745 Jacobite uprising. I know that Kennedys were amongst these fighters as several of them were taken prisoner and held at Stirling jail; their names are listed in 'Prisoners of the '45'. These may have been part of the Kennedy branch who moved from Ayrshire to Lochaber and pledged allegiance to Lochiel, the Cameron chief. Confusingly, however, it is also told that at one stage some of these same Kennedys sided with Keppoch, one of the MacDonald chiefs in Lochaber - and a Kennedy from Keppoch's regiment is also amongst the captured prisoners I referred to. He gave his place of origin as 'Perthshire' only. Rannoch had another reputation at the time though - cattle rustling. This practice seems to have been endemic to the region and added to the problems of the Highland drovesmen taking their cattle south to the big markets in Comrie and Falkirk. I discuss this in a separate article.I don't know who exactly it was who did the rustling or whether those living down at the loch shore took part. Kenmore 1636, Killin 1687, Dull 1703, Blair Atholl 1718. There is enough evidence from what records we do have, that there was a strong association between the Kennedys and Camerons in Rannoch and that this was very much Cameron country. In fact most of the Kennedy men had taken Cameron wives (Angus' parents being a rare exception). This coupled with the geographical location convinces me that these are Lochaber Kennedys, nominally a sept of Clan Cameron. I am not the only one to reach this conclusion; top genealogist Donald Whyte, President of the Scottish Society of Genealogists, has made the claim that the Lochaber Kennedys moved down to the next parish of Dull c. 1550; they could only have done so by crossing Rannoch. We are lucky to have other records from earlier times, most notably the transcription of the Perthshire Hearth Tax of 1691-2 published by the Scottish Genealogy Society. One has to pity the collector for Perthshire, Lauchlane McIntosh; one of the purposes of the one-off tax was to make up for all the funds the government had spent fighting the Jacobites. In one area, Glencoe, he was unable to get any of his forms filled in at all. The tax return does not amount to a census as it did not always list the poorest people and even without having to deal with Jacobites, collection in rural districts was usually difficult. It has been suggested that it only represents, in Scotland in general, between 1 in 5 and 1 in 7 inhabitants. Even so, the numbers of Kennedys listed is disappointing - just five (compared with 43 Camerons). And those five are mainly in the nearby parish of Logierait which also showed the highest numbers of Kennedys in the first formal census in 1851. But this is as much due to everyone vacating Fortingall as any other factor. 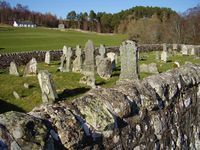 'Item in Atending at the Castell of Blair in Athell and other places of the Countrayes ther aiqasent to wit Athell, Bredalbine, Ranoch for colecting the herth money ther of the parioches of Blair Strovan, Kiline, fortengell, Dull, Mullion, Logierait, Dullie Kenmore, & weim, not being in saiftay to traivell singlay the Gairesone refivising protecthshione without the Gairisone aither for my selfe or the money & having stayed ther taking ther Lists and recd the money 1st and Last the space of thrie Mounths Jacqrieds wth 8 men for convoying the money and me to the severall placess at 6 Sh per deim for ther days quich amounts to ... 476 pounds [in total]. (this transcription retains the original erratic spelling and punctuation including the small 'f' for the parish of Fortingall and 'w' for Weem.). 1784 Estates returned to Colonel Alexander Robertson, complete with acrrued debts from the intervening period! Visiting Rannoch (Raineach in Gaelic) in April 2006. I made my first visit to Rannoch, but not the Loch, on April 15th 2006 by train from Glasgow, a journey of some 2h 40m. The land to the west of the railway line now belongs to Rannoch Barracks and that to the east belongs to the Dunan Estate. There are a number of trails you can use but if planning to go off these, you are asked to contact the estate owners by telephone for permission: Rannock Barracks are on 01882 633248 and the Dunan Estate is on 01882 633266. Adjacent to the Rannoch station is the Muir of Rannoch hotel. They provide lunchtime meals and can do evening suppers on request, tel. 01882 633236. There is a cafe at the railway station along with a small Visitor Centre. The railway across Rannoch Moor was built in the 1890s and employed over 5000 navvies. It was completed in late 1893 and officially opened on 11 August 1894. Building it involved dumping thousands of tons of concrete ballast into the peat bog to lay the tracks on; one deep section couldn't be ballasted due to its depth and a viaduct had to be built just north of Rannoch Station. The wildness of this region can be judged by the fact that when the first engineers set out to explore Rannoch Moor in 1889 to plan the route, they all got lost and had to be rescued! There is a bus service twice a day to Kinloch Rannoch at the east end of the loch. In the other direction a trail takes you on a 12 mile hike to Glencoe via Loch Laidon. If coming on the train, remember you are six miles from the start of the Loch and the stretch of water that first comes into sight is Loch Eigheach, not Loch Rannoch. Visiting Loch Rannoch in April 2007. I made my first adult visit to Loch Rannoch (having climbed Schiehallion as a young boy) in April 2007. It's a difficult place to reach, particularly if combining with a trip to Lochaber. From Fort William I took the A86 along Loch Laggan, then turned south through Dalwhinnie and joining the southbound A9. Before reaching Struan a tiny track leads over a pass to Trinafour and Kinloch Rannoch is just a few miles further on. Confusingly Kinloch is not at the head of Loch Rannoch - Kinloch being derived from the same Gaelic word 'ceann' as Kennedy. From there the B846 road leads along the north shore where it reaches a dead end at Rannoch railway station. This B road takes in Aulich, Ardlarach and Killichonan cemetery. The latter is dominated by MacGregors who made Loch Rannoch their home in the 1700s and to a lesser extent the Camerons. No one clan controlled these lands. I only found 2 old gravestones for Kennedys in Killichonan, despite only being a mile from Ardlarach; a spouse of Duncan Menzies and a spouse of Ewen Cameron. 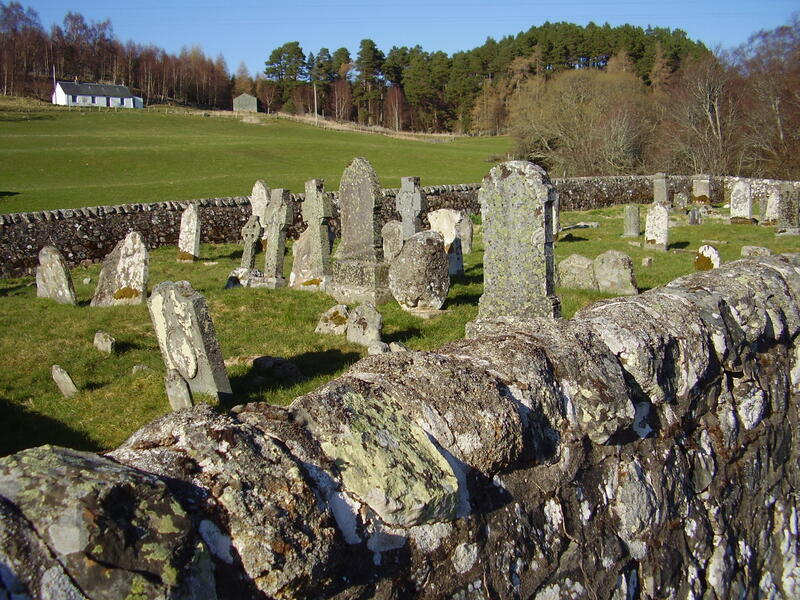 Old Rannoch churchyard at Kinloch Rannoch was even poorer pickings with just one female Kennedy, a spouse of Donald McLellan. I have discovered an interesting Gaelic resource relating to Rannoch, which even includes a reference to a Kennedy there in 1739! Black, Ronald, 'Mac Mhaighstir Alastair in Rannoch: A Reconstruction' Transactions of the Gaelic Society of Inverness (1994-1996) 341-419 This detailed article examines a poem written by the above, the Gaelic manuscript of which is in the Advocates Library, Adv. MS 72.1.39. Whilst much of the article is concerned with the identity of the author, the contents of the poem and background on life there in those days (quoting Cunningham and other sources I have already listed), in the footnotes of the MS are notes on several financial transactions. One of these is to a Duncan Kennedy for �200. Tantalisingly no further information is provided, but Black has made great efforts to determine Duncan's identity. For those not familiar with the area, I should explain that Finnart lies on the south shore of Loch Rannoch, about one mile east of Rannoch Barracks. Although this puts them on the opposite side of the loch to my own line, the Kennedys of Finnart have been studied by fellow researcher Duncan Hartley who wrote an interesting article about his studies. This group should not be confused with the Kennedys of Bennane and Finnarts, Finnarts also being a placename in south-west Scotland overlooking Loch Ryan. 'This brings me finally to consider the position of Finnart as the terminal for traditional routes across Rannoch Moor. The most important connections across the moor are NS and NW-SE which helps explain why the Struan estate was full of Glennevis Camerons and Keppoch MacDonalds and indeed also why the Gaelic of Rannoch shares so many features with that of Lochaber, standing apart from the rest of Perthshire - the dividing line between East Perthshire Gaelic and West Perthshire Gaelic has been described as lying between Lochs Rannoch and Tummel (1,2)'. *SPCK - Society for Promoting Christian Knowledge pioneered the creation of local schools in the 1700s, and later had a reputation for attempting to replace Gaelic with English. mac Mhaighstir was himself an SPCK teacher and with their encouragement produced the first Gaelic-English dictionary. 'S b'fhada buan a spalagan.